You will find a list of all of the sterling silver boxes Nelson and Nelson has available here. These antique silver boxes can be used however you desire, whether you wish to use them for storing desk supplies or valuables. We also have sterling silver jewelry boxes that are the perfect size to store every piece of jewelry that you own. 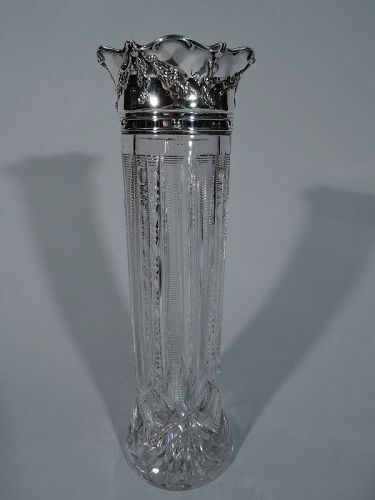 American Edwardian sterling silver and crystal trumpet vase, ca 1910. 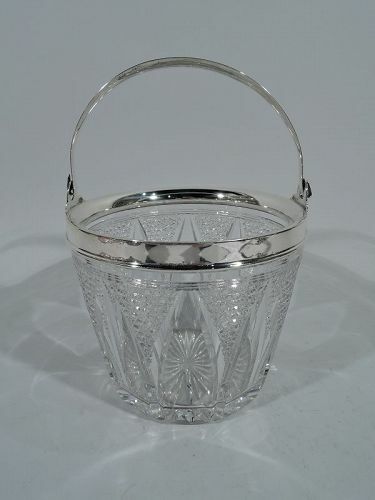 Clear crystal with etched flowers and overlapping strapwork arcade. Notched egg-and-dart rim and fluting at bottom. Domed sterling silver base. Hallmark includes Fifth-Avenue retailer’s stamp Brand-Chatillon. Very good condition. 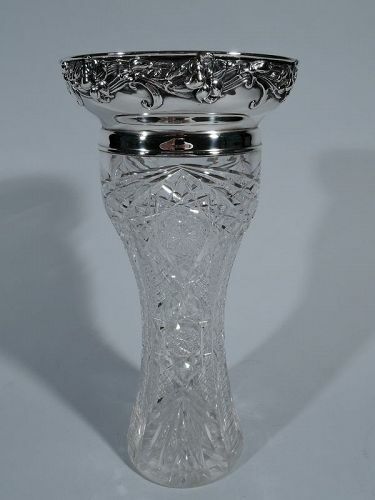 Elegant Edwardian sterling silver and crystal vase. Made by Durgin (later part of Gorham) in Concord, NH. Sterling silver base comprising pierced cylinder on urn mount terminating in upward tapering shaft on raised foot with reeded rim. 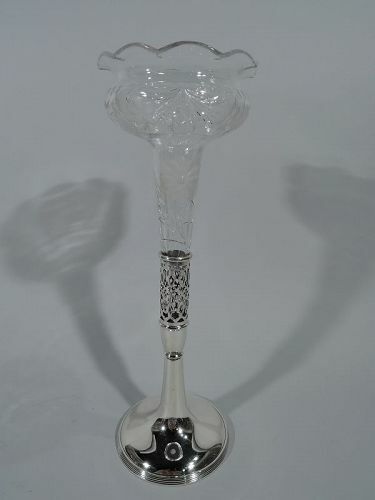 Crystal vessel with wavy petal rim and bellied bowl terminating in cone encased in tapering cylinder. Pretty acid-etched flowers with cut stems and petals. Silver hallmark includes no. 55 and Chicago retailer’s stamp CD Peacock. Very good condition. 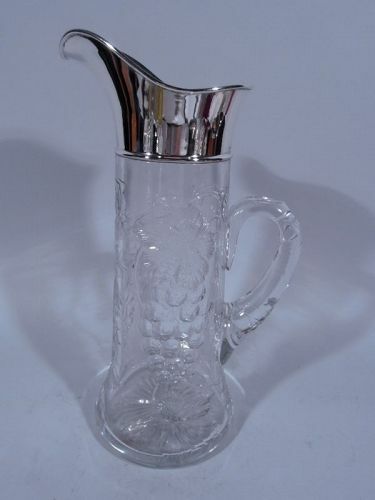 Antique Glass & Sterling Silver Claret Jug by Shreve & Co.
Glass claret jug with sterling silver collar. Made by Shreve & Co. in San Francisco, ca 1910. Cylindrical with spread base and scroll handle. Fruiting grapevine with big leaves and succulent fruit bunches cut to body and handle. Glass clear to show off the hue of the tipple. Plain collar with helmet mouth. Hallmarked. Fine condition. Minor collar ding. 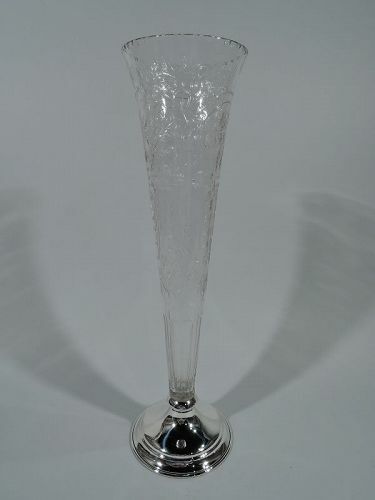 Brilliant-cut glass vase with sterling silver collar. Made by Gorham in Providence, ca 1900. Cylindrical with spread base. Vertical ornament with alternating flutes, ribbing, and notching as well as fans and lozenges with inset circles at base. Collar has applied scattered flowers and scrolled rim. Engraved monogram. Hallmark includes no. D933. Very good condition. 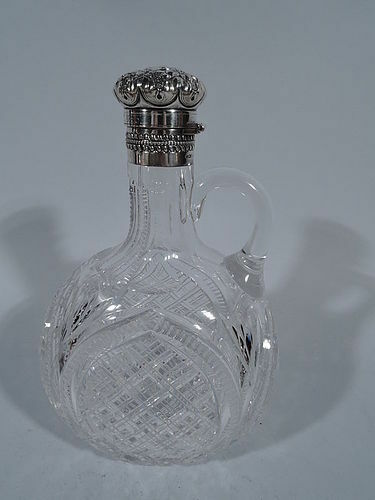 Brilliant-cut glass and sterling silver decanter. Made by Gorham in Providence in 1894. Round body with thumb ring handle. Cut ornament in arched frames. Collar silver as is hinged and cork-lined cover with floral repousse. On cover is engraved block monogram and dates “1870 W. G. C. 1895”. Hallmark includes no. S1744 and date symbol. 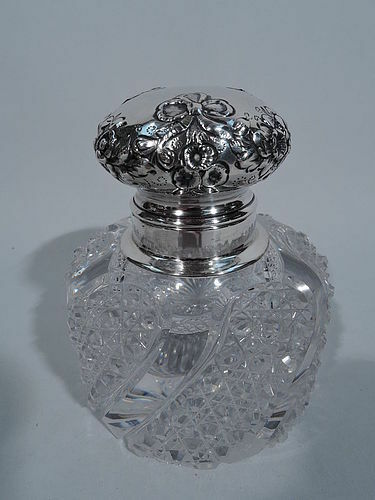 Sterling silver and cut glass inkwell. Made by Shiebler in New York, ca 1890. Drum-form with brilliant-cut twisted lobes. Short neck in silver collar with hinged bun cover. Cover has repousse flowers and bow-tied ribbons. Center vacant. Hallmark includes no. 49. Very good condition.